3D printing technologies are evolving at high speed, but the industrial transformation is only just getting started. Whatever you want, wherever you are, whenever you need it: 3D printing is driving a revolution in the way products are made. As the technology improves, more and more industries are taking advantage of this innovative process – and exploring its potential to transform the future of manufacturing. For traditional manufacturing, bigger has always been better: Huge numbers of products are made on massive production lines in big factories, before being put into large containers, stacked onto giant ships and carried to customers around the world. This keeps the cost of a single product low, but also involves high costs related to storing large amounts of stock – and major problems when shipping gets delayed. This obsession with scale has been at the heart of manufacturing for decades, but now a new technology is aiming to change manufacturing forever: 3D printing. This revolutionary process has the potential to enable manufacturers to make whatever they want, whenever they want it, at a location much closer to the final customer. This would shrink the cost of storage and transport, while also opening up complete freedom to customize designs right down to the smallest detail – from sneakers that are made to fit the unique measurements of your feet, through to a fully personalized interior for your car. Basically, 3D printing involves creating objects one layer at a time: This can be done using materials that change from a liquid into a solid after being printed, or by working with powder-based substances that bond together to become solid. The process uses digital design files to program high-tech printers to produce an object with the specific dimensions required. The technology was first used in the early 1980s – and has benefitted from massive improvements in the quality of printers, software and materials. 3D printing first started to enjoy attention from the world’s media when futuristic-sounding flagship projects began capturing the public’s imagination. In 2015, newspapers and online media were overflowing with stories about a mobile conference building in Amsterdam – because the façade of the building was created using 3D printing. Similarly, excited press coverage focused on another project at nearby Schiphol airport – where passengers can now walk across a customized floor created using this emerging technology. While these high-profile projects attracted the public because of their impressive size, some of the most exciting breakthroughs related to 3D printing involve much smaller objects. For example, many manufacturers are already taking advantage of the technology to create prototypes of small parts and components. This enables them to save time and money because 3D printing eliminates the need to have the prototype made by an injection-molding company. These companies first have to create new tools to produce the parts and often required customers to order a large batch instead of just one or two samples. 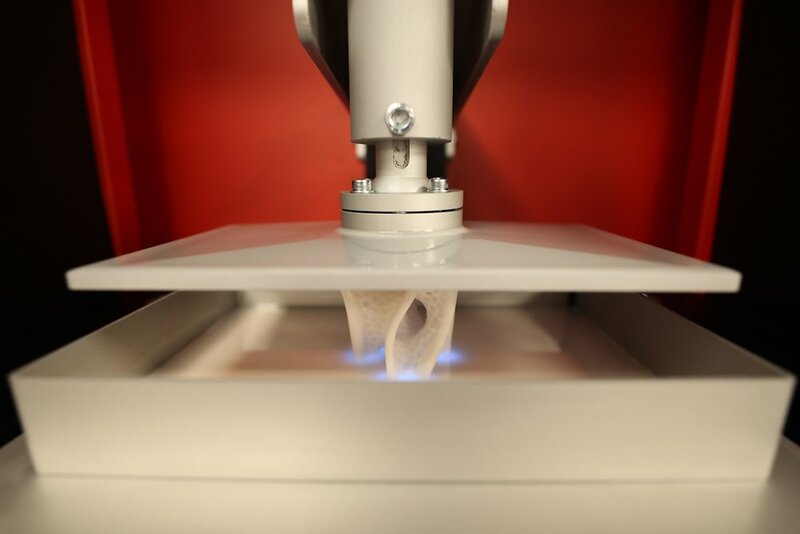 With 3D printing, manufacturers simply open a digital design file and click print. Within a short space of time, they have the prototype in their hand. In fact, 3D printing is now being used for functional prototypes: This means the prototypes can actually be used to perform the intended function of the component – giving manufacturers a clear understanding of whether their design works or still needs to be refined. This could mean that 3D printing will soon be able to replace selected stages within a traditional production process. Some experts think the technology may one day go even further and completely replace an entire production process. The greatest potential for this transformation lies in manufacturing small batches of small products. Shoes are one example: You might wear a size 42 from one brand and a 43 from another, or have one foot slightly larger than the other. With 3D printing, consumers could soon be able to order shoes that are customized to fit the unique size and shape of their feet! The medical sector also offers exciting potential applications for 3D printing: Clamps, pins and sheets of mesh used during operations could one day be created to fit the patient exactly, which would increase comfort while also cutting waste. Of course, 3D printed parts are not ready for use immediately after the printing process: They require finishing touches to enhance quality, add functions and enable the final assembly. In industrial manufacturing, many of these finishing touches are added manually during post-processing. This plays a crucial role in enhancing 3D printed parts by adding required features like resistance against fire, high temperatures or UV light, or by making the parts waterproof. Once the parts have been cleaned or given a special coating, they can be used to perform the specific function required. Partnerships and collaborative research activities related to 3D printing are being set up across a broad range of industries – bringing together innovative players with vastly different expertise and experience. These partnerships aim to explore customized technologies that enable simple, fast and automated digital production processes based on 3D printing for car parts, footwear, medical devices and much more. The ultimate goal is to replace traditional manufacturing processes that are obsessed with scale and change the way products are made forever – by driving the fourth industrial revolution.